It’s official: Smartphones are powerful enough to serve as laptop or desktop computers. What are we waiting for? Or, at least, they’re significantly more powerful than supercomputers were ten years ago. And way more powerful than desktops were five years ago. Smartphones also offer killer benefits that laptops don’t — namely, longer battery life and biometric security. So why are we still using laptops? Microsoft and Qualcomm this week announced a new kind of laptop. In a nutshell, it’s a laptop powered by a smartphone processor running a desktop operating system. Specifically, the new Windows 10 laptops that will be built initially by HP, Lenovo and Asus are powered by the Qualcomm Snapdragon 835 processor. This is the same chip that powers high-end smartphones such as the Galaxy S8 and Note8. Microsoft has tweaked Windows 10 to run natively on ARM chipsets. Initially these devices will ship with Windows 10 S, Microsoft’s simplified and locked-down version of Windows. But customers will be able to upgrade free to Windows 10 Pro. While these laptops aren’t as powerful as other Windows laptops available, the smartphone processor inside them enables faster “always-on” LTE connectivity and “all-day” battery life. Microsoft calls the new category Always Connected PCs. This new kind of laptop will eventually prove valuable for certain types of enterprise users. But what’s really interesting about this development is what it means for the future of using a smartphone as a desktop. The idea of using a smartphone as a desktop computer isn’t new. Various products have existed for many years but never went mainstream. The most recent product I’ve seen is currently being crowdfunded. It’s called the Smartphone Expansion Keyboard, or SEK. The idea is to use a specially built keyboard as the centerpiece of a desktop system. 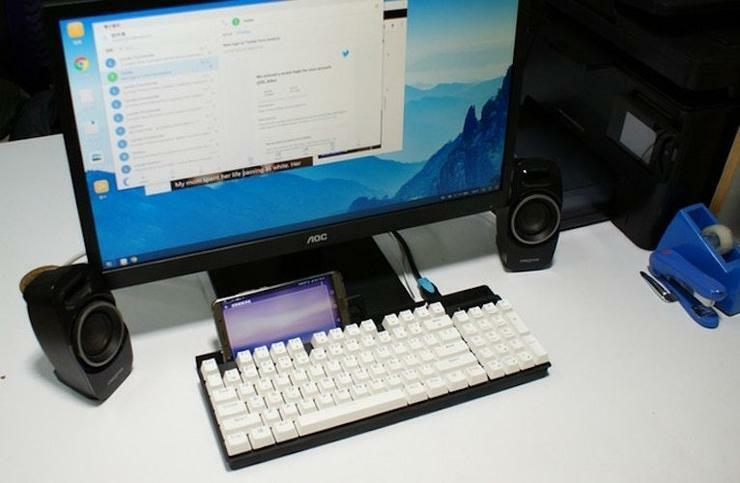 The keyboard has unusual features, including a dock for a smartphone, an HDMI port for the monitor, a USB port for a mouse and peripheral storage, and a Type C connection for the smartphone. In other words, desktop peripherals plug into the keyboard, and the smartphone connects to the keyboard to function as the CPU. Regardless of the quality or success of this project, the concept is sound. Using a keyboard as the “hub” and the smartphone as the CPU is a great approach. Other products are on the market and people are using them right now. The leading product is the Samsung Dex, which is a dock that turns a few Samsung phones into desktop PCs using Samsung’s PC Mode. The Dex has all the major PC ports, plus the option to connect keyboard and mouse via Bluetooth. Another major option is the Huawei Mate 10, which is a phone that offers a PC Mode without the dock. It simply uses a single cable to connect the phone to the monitor. Keyboard and mouse are connected wirelessly from the phone itself. Best of all, Huawei claims that in PC Mode, the phone remains fully functional, including the ability to make and take phone calls. One innovative idea came from ASUS when it released the PadFone. The phone drops into a slot in a tablet, and powers the tablet. The Sentio Superbook is a laptop that you plug into a smartphone; it then uses the smartphone as its CPU. Last, and from a smartphone market share perspective, least, there’s Microsoft’s Continuum product, which enables you to use a smartphone as a desktop and run, among other things, Windows standards such as Word, Excel and others. The problem with Continuum is that it requires a Windows phone. These nascent and largely failed efforts don’t invalidate the smartphone-as-a-laptop-replacement idea. With smartphones growing more powerful (and expensive) every year, it’s really only a matter of time — and of will on the part of the industry. Microsoft’s “Always Connected PCs” involve one desktop operating system running on one ARM mobile chipset. But the implications are mind-blowing when you consider that the Always Connected PC platform sets the stage for all major desktop operating systems to run on all major ARM chipsets. Could Windows 10 Pro be made to run natively on all high-end Android phones? Could macOS High Sierra be made to run on the iPhone X? Could an Android phone turn into a Chromebook in desktop mode and also run the Android apps on the phone in desktop mode? The answer to all these questions, of course, is yes. The problem is that Microsoft doesn’t want you running Windows on an Android phone. Apple doesn’t want you replacing your MacBook Pro or iMac with an iPhone — it wants you to buy both. On the other hand, Google does want you using your Android phone as a Chromebook. And most importantly, Microsoft does want to become a player in the smartphone business — sort of. If you follow the rumors, sightings, cryptic comments by Microsoft executives and other developments, it appears that Microsoft may be working on reinventing the smartphone rather than coming out with yet another smartphone. The rumors all point to a Windows 10 pen-based foldable tablet that runs on an ARM chipset. The idea is that it would be a phone when folded, about the size of a large smartphone. But when unfolded, the dual screens would be the size of a small tablet. It would run Windows 10 on mobile processors, as the Always Connected PC systems do. And given Microsoft’s Continuum project, it should also plug into peripherals and replace a desktop. Such a product would enable Microsoft to compete in the smartphone space with a product that is not a smartphone. Whether Microsoft comes out with its folding phablet or not, it’s clear that the ability to run desktops from a smartphone is ready for mainstream adoption. Now that Windows 10 Pro is running on ARM, now that Chromebooks run Android, now that the latest iPhone costs over $1,000, I think it’s reasonable to say that the world is ready for smartphones that replace laptops and desktops. As smartphones become more powerful and secure (with better biometric security), the demand for very expensive smartphones grows. However, with all that spending on smartphones, the appetite for a separate laptop diminishes. We already carry a supercomputer in our pockets. And all we really need on the desktop is a big screen, full-size keyboard and maybe a mouse or trackpad with which to interact with our smartphones. We also need a desktop operating system running on those phones. I know, I know. Developers, Photoshop users and other power users can’t use a smartphone for their work. But the majority of users can. I believe the industry is ready for smartphones that replace laptops. Are you?